The study aims to evaluate the relative importance of varied carbon cycling pathways in a wetland and how they are linked to the hydrological regime, to explain and quantify the impact of alterations to the hydrological pattern on wetland ‘metabolism’ and carbon footprint, providing improved basis for wetland management. I’m developing a mathematical model able to explore the effects of hydroperiod changes on the carbon cycling in a wetland. 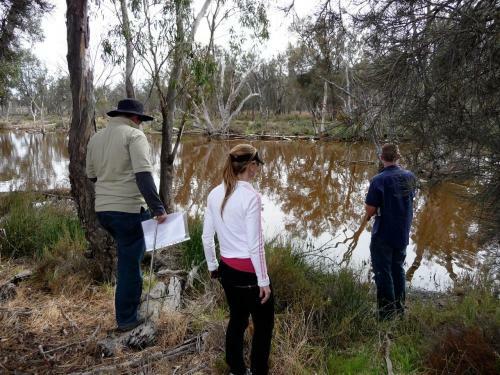 By synthesising the most important pathways in the model, it will be then tested through collection of field data from Lake Toolibin, an intermittently flooded wetland located in the agricultural area of southwest Western Australia that has been threatened by prolonged drought and salinisation. Once the model is considered able to represent the system’s behaviour, it will be used to explore long-term climatic and land-use change scenarios to evaluate their consequences on vegetation, salinity, and carbon processing in wetlands. Although wetlands represent only 4-6% of the Earth's land area, they store an estimated 20-25% of the world's soil carbon (350-535 Gt C) (Dean and Gorham, 1998) which make them important in the global carbon cycling. Hydrological conditions determine aspects such as the presence of particular vegetation communities, and rates of organic matter decomposition (Bradley and Gilvea, 2000). Changes in hydrology can be even more important to arid/semi-arid wetlands, where average annual rainfall is seasonal, highly variable and significantly less than evaporation. It is difficult to quantify changes in wetland metabolism in response to variability in hydrological conditions. Developing a simple conceptual model for the most salient processes involved in carbon cycling in wetlands will facilitate the understanding about possible variability of carbon pathways in wetlands in response to environmental changes and also in response to salinisation. In this sense, this study is expected to improve our knowledge carbon cycling in semi-arid salt-affected wetland environments (typical wetland type in WA).